Paints consist of three key functional ingredients: A pigment for color, a binder that holds the paint to the surface and a carrier that will preserve the other ingredients in liquid form. In many paints, these functions are performed by harmful chemicals. Non-toxic paints are made from all or mostly natural ingredients. They contain no or minimum amounts of toxic chemicals. 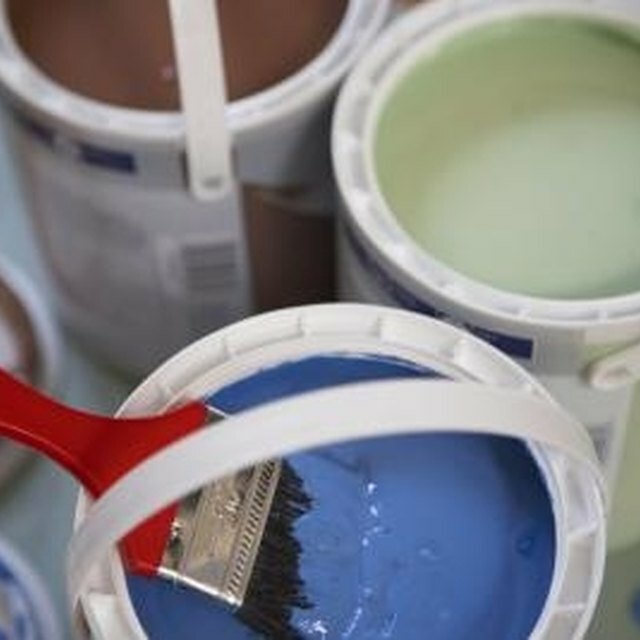 Non-toxic paint can help reduce toxins in your home. VOCs, or volatile organic compounds, are toxic gasses emitted from substances in solid or liquid form. They come from a variety of chemicals and can be found in many household cleaners, glues, inks and particularly paints. According to the EPA, the concentration of VOCs in an indoor space is often five to 10 times that of an outdoor area. The effects of these gasses can cause long- and short-term illnesses. To meet EPA requirements, paints and stains cannot contain more than 200 grams per liter of VOCs. Certified low-VOC paints use water instead of petroleum-based solvents, and as a standard, contain 50 grams of VOCs per liter. These less toxic paints are made with no or very little amounts of heavy metals and formaldehyde. Paints with the Green Seal Standard mark are guaranteed to have fewer than 50 grams of VOCs per liter, and can even get as low as 25 grams per liter. All paints containing fewer than five grams per liter of VOCs can be labeled as zero-VOC paints. Be careful with these because zero VOC does not mean that they are necessarily non-toxic. Paints can contain a variety of other harmful chemicals, such as heavy metals, formaldehyde, biocides and fungicides. Adding color tint can bring up the level of VOCs to 10 grams per liter. Natural paints are made from all natural ingredients and truly are non-toxic. Manufacturers use plant oils and resins instead of petroleum carriers. Colorants are replaced with plant-based dyes and essential oils. Other ingredients of natural paints include chalk, clay and talcum, milk casein, beeswax and mineral dyes. You will notice that when using a water-based natural paint, there will be no chemical odor. Even the oil-based natural paints smell like essential oil and citrus. When applying paint, make sure that you are working in a properly ventilated area. Especially when applying it indoors, do so only with windows open and use a fan to move the air out of the house. Keep in mind that toxic paints can release airborne toxins for years after their application, and can raise the level of VOC concentration inside your home. When selecting a paint, ask for the Material Safety and Data Sheets (MSDS) to be accurately informed as to the toxicity of the paint.